This is a story about what Chicago’s art galleries are doing to grow our local art economy. More than once I have heard an art dealer joke that their commercial art gallery is really a not-for-profit because, well, their business makes no profit. Despite that appraisal, non-profit fundraising techniques are finding their way into the business models of some for-profit startups. Traditionally, commercial galleries have been run as shops that sell products with negotiable price tags. Now, some are experimenting with fundraising and sponsorships as strategies for growth. Oppositely, a couple of non-profit art organizations are incorporating commercial aspects into their practices, such as selling art and organizing an art fair. For a long time, for-profit galleries and non-profits behaved like mirror images of each other, performing similar actions toward opposite ends, yet never touching. However, boundaries were made to be blurred in the art world. It was a huge shock to see NYC dealer Jeffrey Deitch take a director’s seat at MOCA in Los Angeles in order to save the institution from financial ruin. On the flip side, the success of many “social entrepreneurs” is changing how for-profit startups operate, including many art galleries. Indeed, there is no one-size-fits-all business plan for galleries, but the medium-sized art market in Chicago serves as a sounding board for new ventures. In a city where many positive changes have been artist-driven (such as the studio/gallery or the artist/curator), gallerists, too, are getting creative with the business of art. Right now seems a particularly transformative moment in Chicago’s art market. Donald Young has died, rents in the River North gallery district are rising to inhospitable new heights, and Kavi Gupta Gallery is expanding into its third location (with one in the West Loop and another in Berlin). Other galleries are closing. Tony Wight reduced his gallery to a private space without exhibitions, and Robert Bills Contemporary closed after just two years. Golden, based out of a Lakeview storefront, attempted a Manhattan franchise, a venture that seems to have toppled both locations. 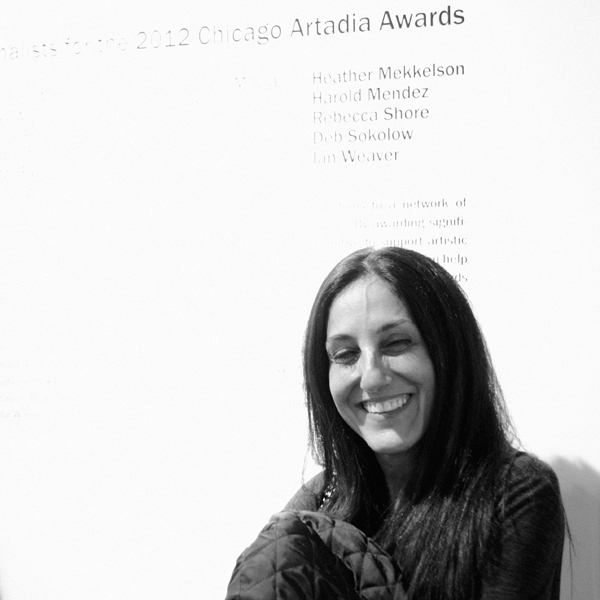 Catherine Edelman, who has run an art gallery in the River North gallery district for more than twenty-five years and is president of the Chicago Art Dealers Association, floated the idea of relocating the entire River North gallery district to Motor Row, a South Michigan Avenue collection of historic buildings formerly occupied by automobile-sales showrooms. Motor Row could be the new Chelsea, but this will not come to fruition right now. “It’s a great area and it’s perfect for galleries but we don’t have millions of dollars to renovate buildings,” says Edelman. This April, George N’Namdi relocated his G.R. N’Namdi Gallery to Miami and turned it into a non-profit called The N’Namdi Center for Contemporary Art. The gallery originally opened in River North in 1996, then became neighbor to Rhona Hoffman Gallery in the West Loop in 2002. N’Namdi continues to maintain his original gallery space in Detroit. He was not available for comment. Klein is a middle-aged guy with a mixed-Midwestern accent. He has lived in Cleveland, Pittsburgh, Maine and New York. He has been a studio assistant to the artists Andrew Wyeth and Kenneth Noland, and he ran a frame shop in Chicago for more than twenty years down the street from Tony Fitzpatrick’s printmaking studio on North Damen. Klein was Fitzpatrick’s framer, and the two became close friends. They published a book, then produced three plays and performed in them. 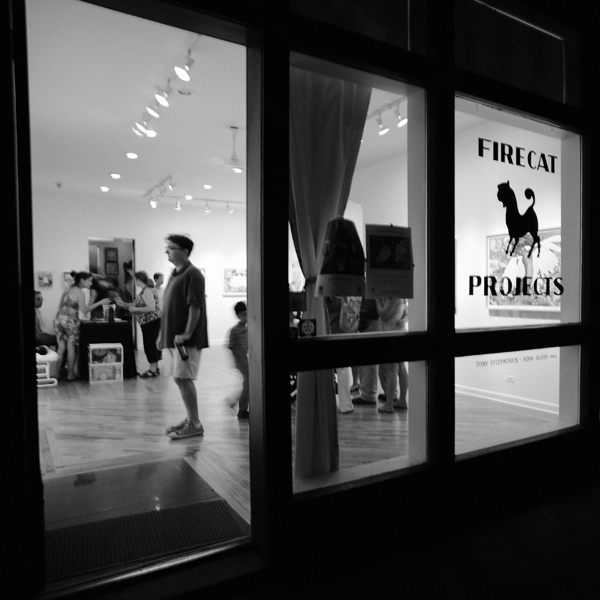 Most recently, they converted Fitzpatrick’s old studio into a new art gallery concept called Firecat Projects. Their idea was to directly solicit art collectors—Fitzpatrick has a cult following—to subsidize the costs of solo exhibitions. 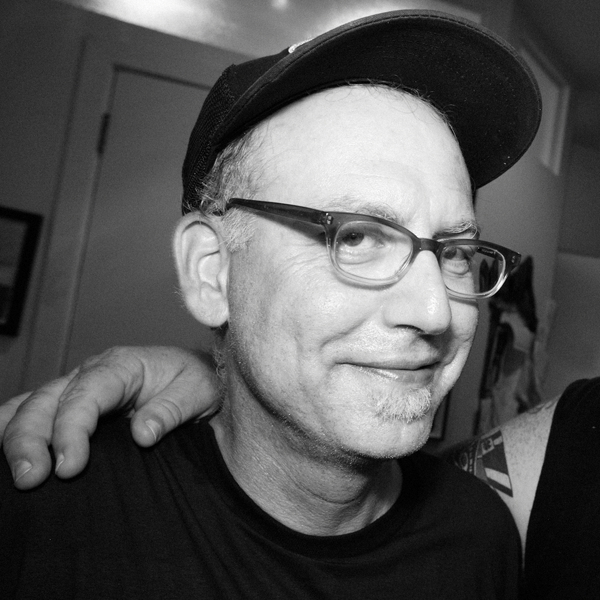 To date, Firecat has presented thirty-four fully sponsored solo shows. Instead of buying a painting, which a collector would likely do anyway, they could pay to sponsor an entire exhibition, including Firecat’s rent, posters, mailings and other small expenses for the one-month exhibition. A typical sponsorship fee is $3,500. It’s a philanthropic move but not tax deductible. Instead, the artist makes a private agreement with the sponsor. The sponsor may get a painting in exchange for their patronage, but there’s no guarantee; it’s up to the artist to make the arrangement. Typically, the patrons aren’t familiar with the artists in advance, but they feel good about supporting the arts in a more holistic way. Firecat’s zero-commission business model was inspired by Fitzpatrick’s notorious repugnance of dealers’ commissions and his rewardingly intimate relationships with his collectors. Fitzpatrick tried to make traditional commercial gallery agreements work for his career but became more successful selling his artwork directly to collectors, without the politics of a middleman. Now, Fitzpatrick has stepped away from Firecat’s operations and Klein is running it full-time. One might be tempted to say that Firecat’s exhibition sponsors are actually temporary financial backers. Commercial galleries get off the ground with the help of backers more times than not. But, at Firecat, the backer is not making an investment; they are giving a gift of cash for operating costs, and there is no contract. “I didn’t want to have a not-for-profit,” says Klein. “I didn’t want to go through a board, all the tax regulations. I wanted it to be for-profit.” Right now the gallery is “bare bones,” says Klein. He estimates that eighty-five percent of revenue from the sponsorships goes toward overhead, and he’s not even taking home a salary yet. If Firecat were a non-profit organization, these numbers would not be attractive to potential donors, who typically like to fund charities with low operating expenses. For Klein, it’s not about making money right now. Instead, he wants Firecat to provide a professional service. “I want the artist to learn how to market themselves,” he says. For each month-long exhibition, Klein gives the artist a key to the gallery so they can bring in potential collectors at any hour of the night (even though Klein keeps the gallery open himself six days a week). He makes the artist the manager of the gallery’s Facebook page. For the artist, “it’s like having a store for a month,” says Klein. “Some artists are stuck in the artist-gallery mentality,” says Klein, about the conventional model where a dealer represents an artist and then takes fifty-percent of sales. “They’re never going to learn the independence of being an artist,” he says. Jayaram, an attorney by training, became the CAC’s executive director in January, 2010, with the intention to resuscitate the dying institution. In three years she has increased the organization’s revenue by nearly sevenfold through some ambitious new business ventures that fund the CAC’s exhibition programming, training services and overhead expenses. Just several years ago, says Jayaram, “‘Entrepreneur’ was a bad word.” With a staff of six full-time workers, a legion of freelancers and interns, Jayaram has rebuilt the CAC into a professional development program where members can pay for classes and critiques a la carte. “Things should not be free to artists,” says Jayaram. “It is infantilizing. That is my personal philosophy.” She says, “In no other profession do you get as much for free.” When artists get things for free, “they may not feel empowered to speak up.” Jayaram says it is the CAC’s “ultimate goal for artists to become professionally sustainable.” The CAC is not a charity for down-and-out artists. 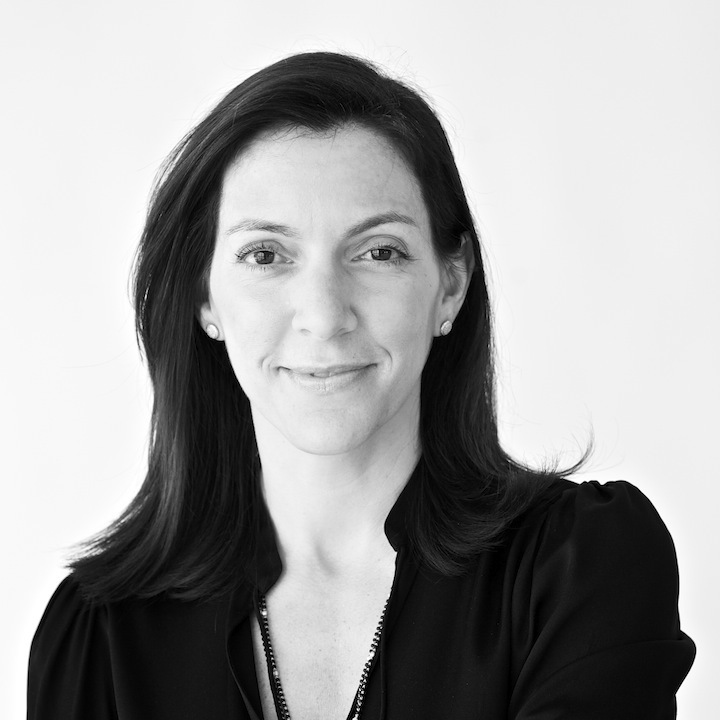 Jayaram is from Miami, where she co-founded LegalArt, a law advocacy group and residency for artists. It survives, and is now called Cannonball. It is a good sign of leadership when an organization can continue to run after its founding director departs. When Jayaram moved to Chicago, she thought about starting up something new, as she had done in Miami. But after scoping around the scene, she was asked by some leaders of Chicago’s Department of Cultural Affairs (now called the Department of Cultural Affairs and Special Events) to consider reviving the CAC, which was founded in 1974 by a group of artists. “It was seen as a hobbyist organization, for Sunday painters,” says Jayaram. She “didn’t want to dismiss those members” because their membership dues kept the organization afloat through its toughest years, but she knew the organization needed to be refreshed if it was going to grow. When she became executive director of the CAC, the institution was a disaster. “It was like running a non-profit in Fallujah,” says Jayaram. She killed the monthly member newspaper, which was hemorrhaging money. She got an all-star board of directors. She acquired an 8,000-square-foot space for the organization in the West Loop. The entire basement floor is filled with artist studios. “The community was skeptical at first,” she says, but the gallery “was the big game changer.” Now, the artist-studio rentals in the basement fund the exhibition space above. These are subsidized by the Warhol Foundation, and rent averages $250 per month. Those accepted into the studio residency are guaranteed an exhibition. It’s the best deal for a temporary studio in Chicago, and the CAC is swarmed with applicants each season. Jayaram is considering expanding into a second site in the very near future. The CAC partly funds its programming costs and overhead with many grants. About twenty-five to thirty-five percent comes from foundation grants. “Chicago is great for philanthropy,” says Jayaram. A slew of familiar foundations fund the CAC, including MacArthur, Warhol, Alphawood, Tremaine, Driehaus and others. “Even in this economy there are plenty of resources for small non-profits,” says Jayaram. Jayaram is getting creative with her executive board. “We want to grow aggressively using their connections,” she says. She calls them her “power board.” They are “a brain trust, not a bag of money.” Together, they’re seeking national relationships outside of Chicago in the communications, marketing and technology arenas. This includes the CAC’s “strategic partnership” with the Pitchfork Music Festival. “The lawyer in me likes negotiating and making deals,” says Jayaram. Jayaram’s expansion plans for the CAC are bold. One frontier is the internet. Another is art fairs. Both have the potential to be astronomically lucrative. The CAC recently absorbed an important website called the Chicago Artists Resource. Founded in 2005 and operated by Chicago’s Department of Cultural Affairs, the website allows users to find jobs, grants, events and professional advice in several different creative industries, not just the visual arts, yet the site was perpetually operating beneath its fullest potential. The demand for its services is high. The city asked if Jayaram could take over CAR, and she agreed, and hired staff to develop it. Right now, CAR serves Chicago users only, but a plan to expand it nationally has been in place for a while. Jayaram loves this idea. Other cities could use a similar platform, and the CAC could earn money from syndication licensing fees in each city that wants to open its own digital franchise. There will be webinars, like how to stretch a canvas, and other video tutorials. A feature will be added similar to Angie’s List, where artists can pay to post their professional services (like building shipping crates, taking exhibition photography, and so on). The CAC is also in the very interesting position of co-founding the first satellite art fair to run concurrent with EXPO, in September. The fair is called Edition Chicago, and a group of fifteen galleries and non-profits (by invitation only) will sell artworks at a price-point of $5,000 and less. The CAC is partnering with dealer Andrew Rafacz to run the fair. Tony Karman, who runs EXPO, is also the chairman of the CAC’s board of directors. 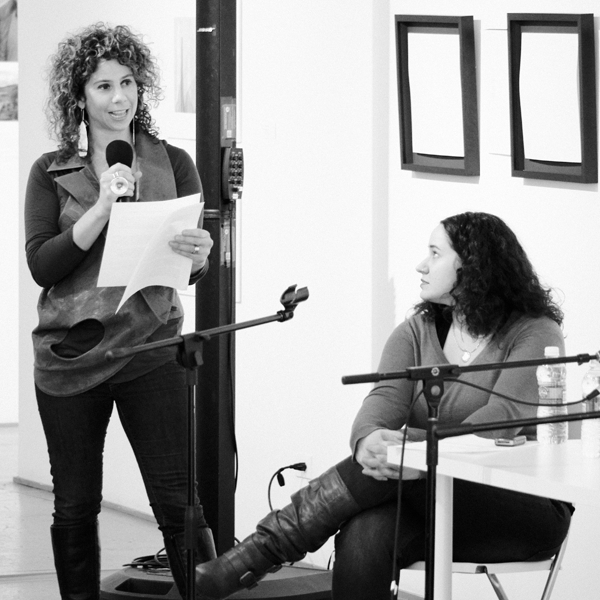 Karman calls the CAC’s fair “a wonderful enhancement” to the EXPO Art Week. Joshua Herrington has been trying to get his new for-profit gallery business, called Gallerista, off the ground for the past six months. “Gallerista is a digital platform connecting contemporary artists to potential patrons, collectors and the public at large,” describes their mission. In other words, it is a website where viewers can purchase art (some of which is selected by Herrington and some uploaded by artists), and request his private services as an art advisor and artist liaison. 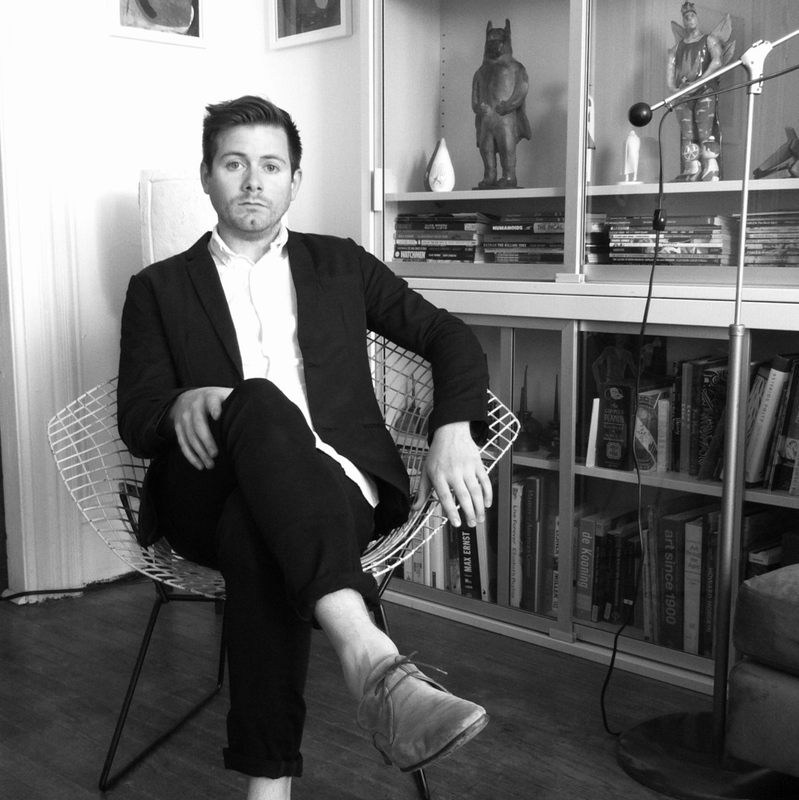 Herrington believes that traditional artist-gallery relationships make it too difficult for new collectors to learn about and purchase art, and he wants to make those processes easier. Herrington recently embarked on a large crowd-sourced fundraising campaign to leverage his private gallery services. It’s a now-familiar non-profit fundraising tool used in an unconventional way. Herrington has worked in non-profit arts organizations, including the CAC with Carolina Jayaram. Three years ago, Herrington earned a certificate from SAIC in their non-profit arts management program (which no longer exists). What motivates donors to gift cash to Gallerista? His financial supporters are not really donors (they get no tax-deduction on their charitable contribution) nor are they investors (they get no return on their investment). So far, Herrington’s profits from his campaign are mostly votes of support from friends and peers. A new business structure, called the L3C, allows for low-profit limited liability companies to organize in Illinois, which could potentially answer Herrington’s fundraising problem. Illinois is just one of a handful of states to allow the L3C, which is a hybrid of for-profit and non-profit corporate structures. The main draw for the L3C is that it allows a for-profit business to accept grants from private foundations, which are normally restricted to non-profits like the Chicago Artists’ Coalition. “The L3C must have a primarily charitable purpose with profit making as a secondary purpose,” describes a Forbes article from January 13, 2012. The L3C does need to have a board of directors, but the business owners can earn a salary from profits earned after the taxes are paid. The L3C is a potentially controversial model, but its development could aid social entrepreneurs. The Marc J. Lane Wealth Group is advocating for the L3C in Illinois. What if Gallerista doesn’t fulfill its $27,500 goal? Herrington says he’s considering the L3C status. Either way, he’s eager to get back out into the community to talk with supporters and advisors about how to make a “user-friendly” art-buying experience that positively benefits artists, too. “It’s a strange line that I’m toeing but I’m excited by it because it opens up to a lot of possibilities,” he says. One West Loop art dealer, Linda Warren, owner of Linda Warren Projects, wants to grow a non-profit arm on her for-profit gallery. She calls it Higher Art: Conscious Corporate Collecting, and it involves her gallery selling art made by inner-city school children to corporations and businesses. Warren will not turn a profit from the sales; she merely wants to do a good deed. All sale proceeds will be redirected toward a school in need of a financial boost, for example, for art supplies. The decision would be made by the child artists as a way to empower them, says Warren. Warren’s gallery has been in business ten years in Chicago. She started selling art from her home in Los Angeles, and had a financial backer when she opened in Chicago, as many gallerists do. In the past few years, Warren has made a couple of career-saving art deals with corporations that collect art for their offices. It was during these experiences that Warren realized corporations want to give back to the community as well, and she figures that her Higher Art program would be a win-win for schools and businesses alike. She has not yet spoken with Chicago Public School officials about her idea, which is still in the concept phase of development. “As artists, it’s not in bad taste to talk about money anymore,” said artist Anthea Black at a conference in New York City a couple months ago. 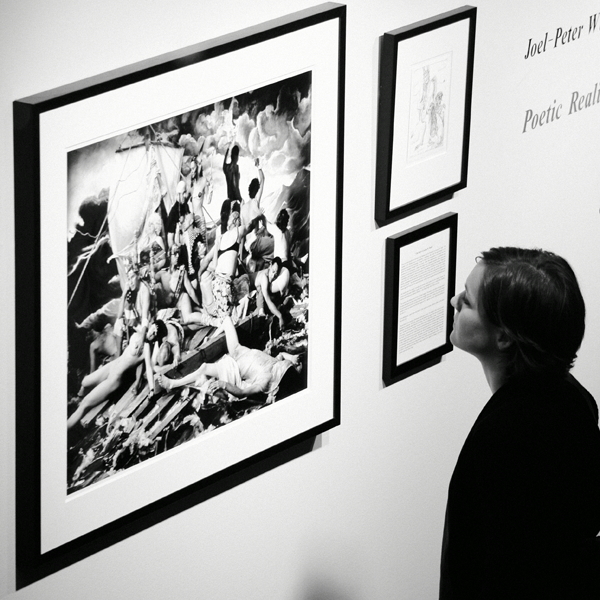 Likewise, for galleries, not-for-profit strategies no longer seem taboo. The longest living galleries in Chicago have traditionally sat on either side of the equation: for-profit or not. Now, growth could come from either end, or somewhere happily in the middle. 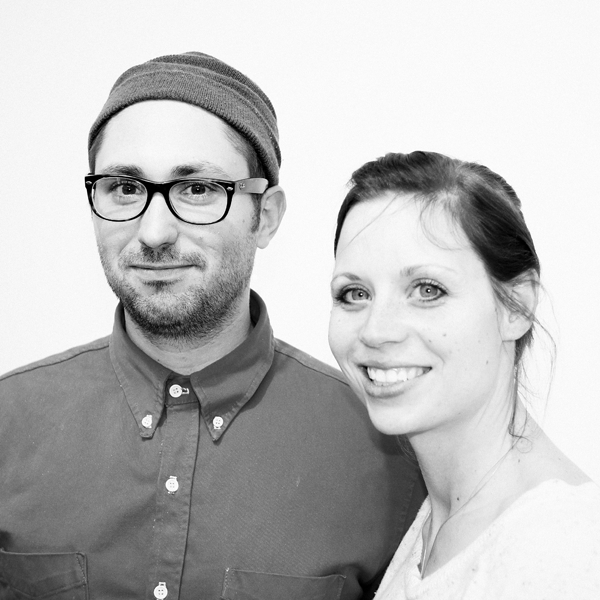 In the gallery business, the so-crazy-it-might-just-work strategy works as often as not. If it works, and it’s legal, then it’s golden.